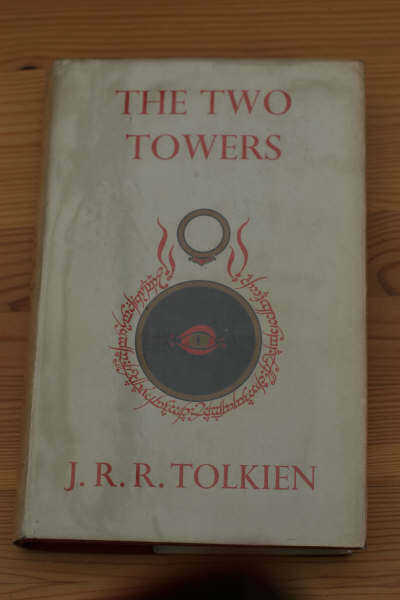 First Edition set (4/1/2) with published Tolkien letter. - $8,800.00 This letter is number 336 in The Letters of J.R.R. 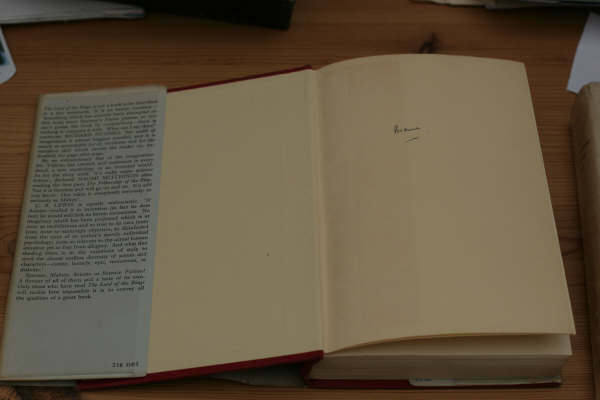 Tolkien, edited by Humphrey Carpenter, to Sir Patrick Browne. 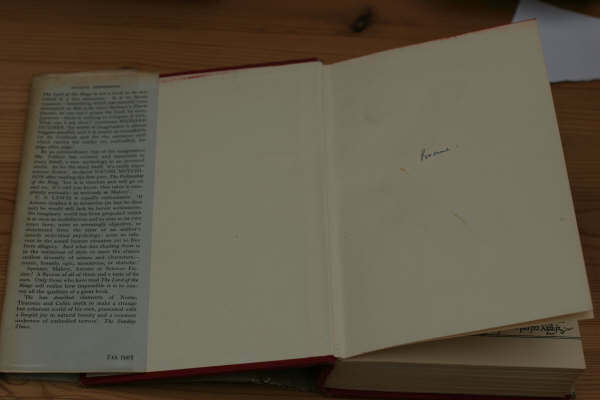 The books are inscribed by Browne in ink. 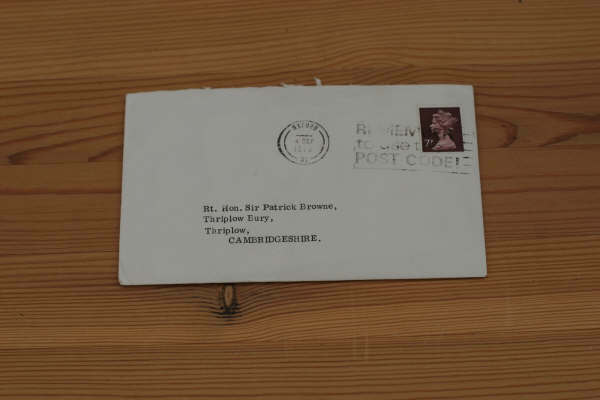 There is also a letter from Carpenter to Browne. A rare and valuable association copy. This letter is number 336 in The Letters of J.R.R. 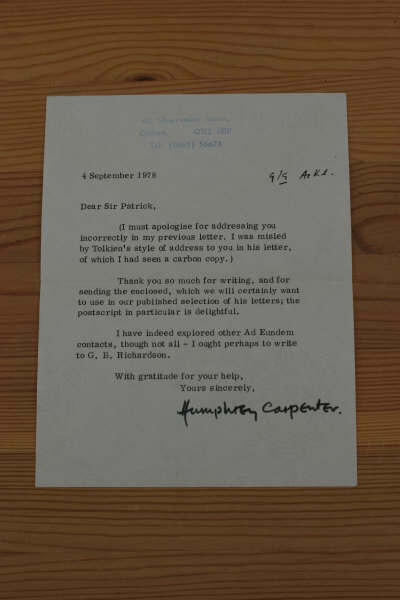 Tolkien, edited by Humphrey Carpenter, to Sir Patrick Browne. 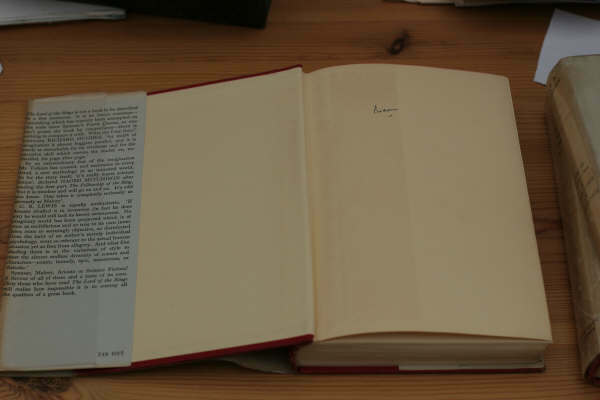 The books are inscribed by Browne in ink. 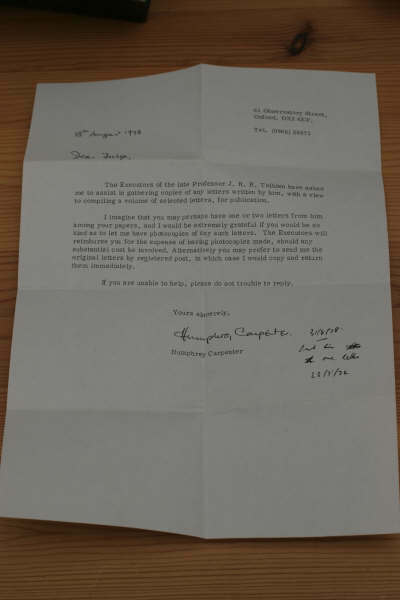 There is also a letter from Carpenter to Browne. A rare and valuable association copy. 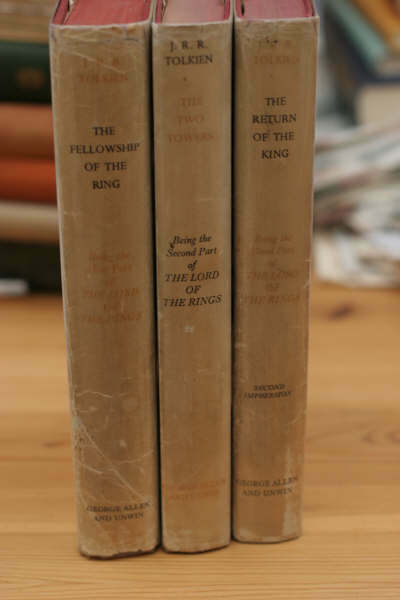 Very Early set of 1st editions, with published Tolkien letter. This letter is number 336 in The Letters of J.R.R. 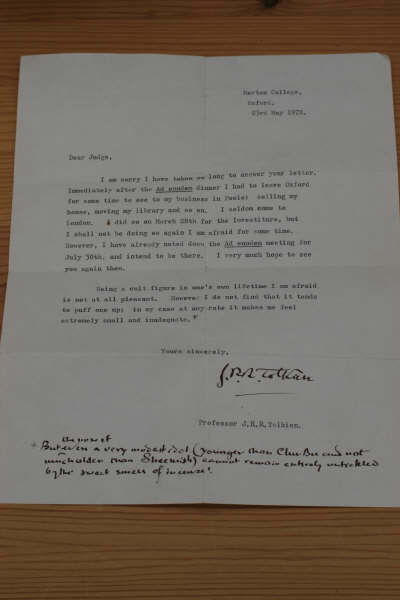 Tolkien, edited by Humphrey Carpenter, to Sir Patrick Browne. 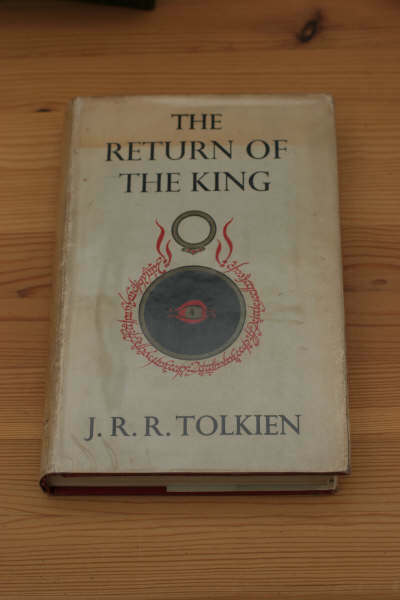 The Return of The King is a 1955 2nd impression. All complete with original dust jackets, not clipped, Books bound in original red boards, complete and with all maps present. hand-written part of the letter) ".... But even the nose of a very modest idol....." although the letter actually states "But the nose of even a very modest idol...." which I believe is grammatically more correct (which is what you'd expect from an English prof). 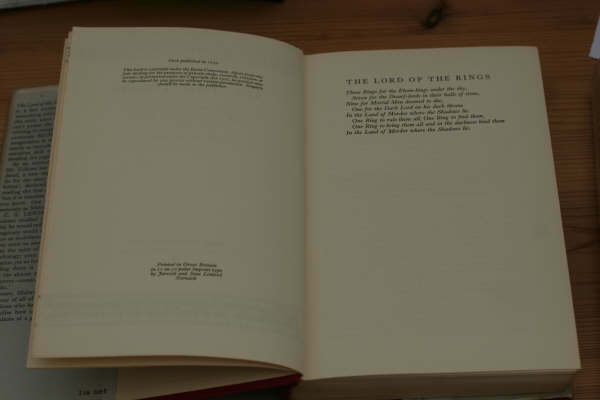 Tolkien writes regarding his popularity "Being a cult figure in one's own lifetime I am afraid is not pleasant. However I do not find that it tends to puff one up; in my case at any rate it makes me feel extremely small and inadequate." beautifully typed and hand written with flowing signature. This also comes with a letter of correspondence by Humphrey Carpenter regarding the publication of the letter. The 3 volumes have a small neat ownership name by the reciepient of the Letter on the FFEP. Slight offsetting as usual and wrappers sunned and slight edgewear. Overall a lovely and unique set. The only published letter available at present. Signed by Author. 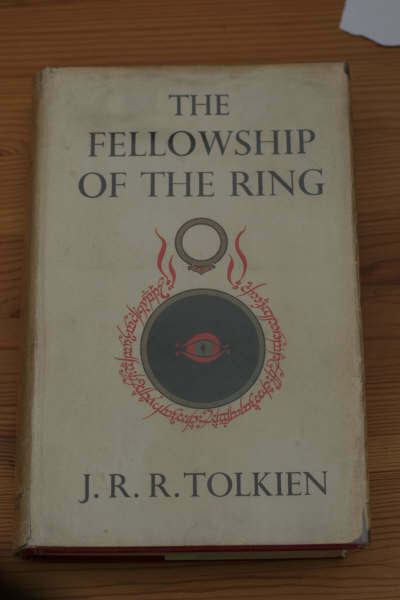 Hard Back"
A fantastic set of First Editions of this classic of fantasy literature, every true collectors "must have".